Look at this gorgeous tree fungus we came across while hiking in the Haliburtons last week. The pictures don’t really do them justice. They practically glowed orange in the woods. No idea what they are and Googling them turned out to be more complicated than I expected (a good reason why I will never eat mushrooms I find in the wild). 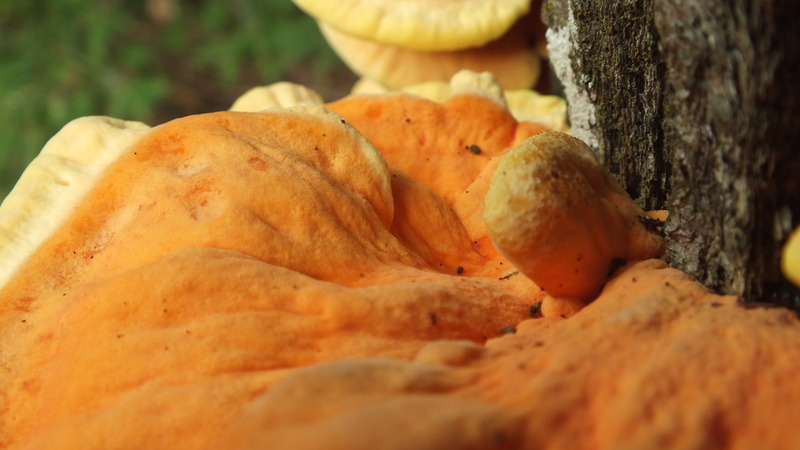 If I had to name it, maybe I’d call it Pumpkin Pie Fungus. Anyway, I thought I’d stick them here and maybe an expert will wander by and provide an ID. Meanwhile, aren’t they pretty? According to Twitter user Stewyc12 (who seems to know his ‘shrooms) .. these are commonly known as Chicken of the Woods, named for their “tastes like chicken” qualities. 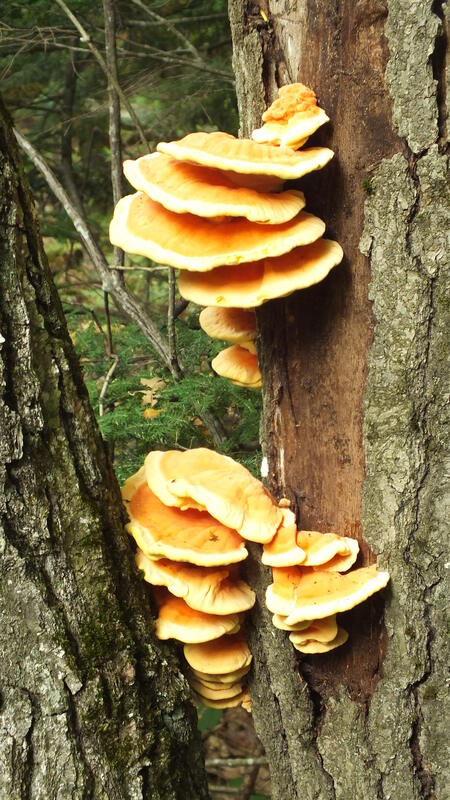 Also going by such names as sulphur shelf, chicken mushroom, quesadilla of the woods, or chicken fungus, the mushrooms are of the genus Laetiporus. All members of the genus are edible and apparently can be used as a substitute for chicken in standard recipes. This is a good description (with photos) of the taxonomy. *it should be noted that these are not the same as “Hen of the Woods” mushrooms. 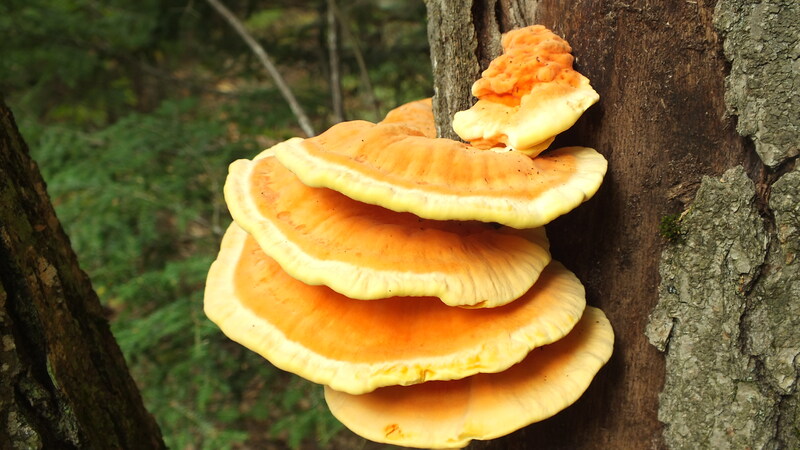 Because of their distinct color and shape, Chicken of the Woods are considered “safe” mushrooms (one of the “foolproof four” – mushrooms with no toxic look-alikes) for beginners gathering edible wild mushrooms. (Of course, selecting wild mushrooms with an expert is always advised over IDing them from internet pictures). Despite their safety, some people have reported mild reactions to the mushrooms. This may be due to personal sensitivity or the type of tree that the mushroom is found on. In any case, I’d be a little cautious. This page has a good detailed description of the mushrooms to help confirm their identity.